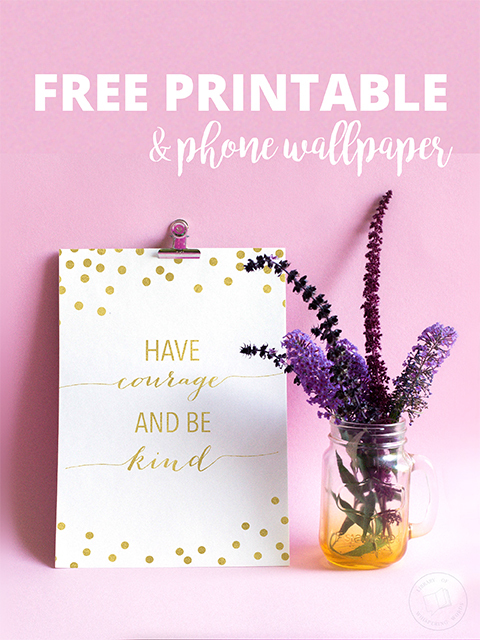 This week's motivational words of wisdom to help kick-start your work week are Have Courage and Be Kind. It can be so easy to let the negative and ugliness of the world get in the way of living a bright and fulfilling life. This week, in the midst of all that you might be facing, choose joy, find courage, and be kind. I know it might be difficult, but I challenge you to find one specific person you can shower with kindness. Maybe you have a co-worker that is always getting on your last nerve, or you are going through a rough patch with a friend or close relative, whoever it might be, have the courage to show kindness. I promise your whole week will turn around if you do! To help remind you of this week's motivational words, feel free to print them off and hang in your home or office. You can even download the quote and add it as your phone wallpaper. This way you can have the reminder right at your finger tips! Do you have a favorite motivational quote that helps you start your week? I fell in love with Jay Asher's novel TH1RTEEN R3ASONS WHY when I first read it back in my senior year of high school. I still love the novel and continually recommend it to my students. It tells the story of two people. Hannah Baker, a high school senior, takes her own life, but not before recording 13 cassette tapes explaining why she ended it. Clay Jenson, a former coworker and crush, becomes a firsthand witness to her pain and suffering as he listens to her tapes. What he discovers changes his life forever. The Netflix adaptation was released the first day of my Spring Break. So naturally, I did the sensible thing and binged watched all 13 episodes. Talk about ALL THE FEELS! As I relived the story through a different lens I could not stop thinking about the importance of taking the time to be truly invested in the lives of people around us and to show we deeply care. A week and a half later and the emotional hook of Hannah's story continues to pull at my heart strings. Many aspects of the episodes continually replay in my mind as I contemplate how the story would have ended if at least one person took the time to stop and listen to Hannah. To show that they truly cared, and cared enough to let her know. I thought about how if Hannah's school had better policies, programs, and practices in place she might still be alive. So I took all the feelings, thoughts, and emotions swirling around and got to designing. I created a secret board on Pinterest and began pinning images and quotes that captured Hannah's story. I then selected my five favorite to create an inspiration board. This phase was a helpful starting point for the rest of the project. I was drawn to buttons on a cassette players and knew I wanted to incorporate them into the logo design. In thinking about Hannah's story, had her friends stopped to see the changes in her behavior, actions, and mood, her life could have ended up different. There is a second part too. They needed to actively listen when she called out to them. The same should go for anyone regardless of what they might be going through in life whether it be anxiety, depression, addiction, or suicide. Along with the logo design I created a Stop & Listen emblem for individuals to make the pledge to be invested in the lives of the people around them. The icons capture the message of caring and careful listening. Stop & Listen is a logo, brand, and website design inspired by Jay Asher's novel TH1RTEEN R3ASONS WHY. What are your favorite aspects of the project? When I watched the new Beauty and the Beast trailer teaser last month, I instantly got goosebumps. This movie is going to be magical. Truly fantastic, especially with Emma Watson as Belle! Seriously, though, she's the perfect Belle. Flawless. Beautiful. Well-read. I grew up on Beauty and the Beast. I watched the movie so often I wore out the VHS. I read all the Disney Beauty and the Beast storybooks I could get my hands on. I spent my days dreaming about having a library just like Belle's, and at night, I fell asleep to the Disney Beauty and the Beast soundtrack. You can imagine my extraordinary delight when I heard Disney was going to bring this beloved tale back to the big screen. If you're like me, then the wait till March is going to be a bit aggravating. To help pass the time I've created a list of 12 Beauty and the Beast retellings that are sure to keep you entertained. Check out the list of books and their goodreads descriptions below. Orasmyn is the prince of Persia and heir to the throne. His religion fills his heart and his mind, and he strives for the knowledge and leadership his father demonstrates. But on the day of the Feast of Sacrifices, Orasmyn makes a foolish choice that results in a fairy's wretched punishment: He is turned into a beast, a curse to be undone only by the love of a woman. Thus begins Orasmyn's journey through the exotic Middle East and sensuous France as he struggles to learn the way of the beast, while also preserving the mind of the man. This is the story of his search, not only for a woman courageous enough to love him, but also for his own redemption. In the forest, Wusamequin, the young and handsome medicine man, looks to avenge the death of his wife and child at the hands of British soldiers. When Wusamequin spots Isabella and her father, he alerts his warriors to capture them. But Wusamequin is quite taken with how bravely Isabella battles. He orders the warriors to spare her and her father, and they are dragged back to their village. However, many members of the Mohican tribe still want them to be killed. In a desperate plea to Wusamequin, Isabella vows to stay as his hostage if he lets her father go. Holder's colonial "captured-by-Indians" romance is an homage to "Last of the Mohicans" and a retelling of "Beauty and the Beast". 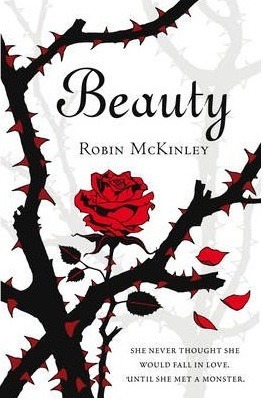 What Beauty and the Beast retellings do you recommend? Leave a comment and let me know! The Lady Janies (Brodi Ashton, Cynthia Hand, and Jodi Meadows) set out to tell the entirely (but not really) true story of Lady Jane Grey. Before we get into The Lady Janies tale, let’s review what the history books tell us about Lady Jane. At the age of sixteen, Jane is married off by her cousin King Edward VI to Lord Guildford Dudley, son of John Dudley, the Duke of Northumberland. Upon the king’s untimely death, Jane becomes Queen of England, due to Edward’s wishes in his will. Her reign is short lived, however. We’re taking nine days short! When Edward’s half-sister Mary, a.k.a Bloody Mary, overthrows Jane and crowns herself as queen, Lady Jane and her husband are locked away in The Tower of London and are later both beheaded. Much of history remains the same in this new tale, expect for several significant details. Let’s focus on three main ones- without giving away any spoilers, of course. In the middle of the sixteenth century, people were blessed or cursed (depending on how you look at it) with the ability to transform between human and animal form. We’re talking full fledge animorphs. As you might imagine, some people found this ability to be rather magnificent while others were utterly appalled. Because the latter camp was largely in charge, the Edians were persecuted and hunted. That was until King Henry VIII discovered he could transform into a lion and decreed that Edians weren’t all that bad after all. Jane’s betrothed Gifford is a horse. Every day at dawn he becomes a noble chestnut steed, but transforms at dusk back into his human form. The two must learn how to navigate being newly weds who can only spend half the day together as humans. You would think having to adjust to an arranged marriage would be challenging enough without the husband turning into a horse during the day aspect. The King wants nothing more than to experience his first kiss. He is only fifteen after all and girls are so much more interesting than ruling and making decrees. My Lady Jane is the first novel I can remember reading with more than one author. I was concerned if the writing styles of each author wouldn’t flow well together or if it would be obvious which author wrote which part. Totally not the case! The story is so fun and enjoyable, and extremely well written! The humor is fabulous. Too often I found myself laughing out loud! A dash of Princess Bride, a pinch of Monty Python, and a sprinkle of Shakespeare are all the ingredients in this comical retelling of Lady Jane Grey. My favorite part of the novel is all things Jane. During her lifetime Jane was considered the most educated and well read lady of her time. It comes as no surprise the Lady Jane in our tale spends her days with her nose buried in books. She’s a true book lover through and through. Her #bookstagram feed would be royally sought after. The banter between Jane and G is not like the typical YA love drama. It was fun to see their relationship grow and change. If you enjoy comical and fantastical tales with a bit of romance, or enjoy a good retelling of history then I recommend you check out My Lady Jane. Long live The Lady Janies! May their pens continue to retell history as we only wish it could be! This print is supplied from Whispering Words Design and is available for your personal use. You may not use this download for professional or commercial use. There is much more to the Fourth of July weekend than parades, bar-b-ques, fireworks, swimming, camping, and parties. Over this long holiday weekend dive into one of these eight novels that sheds light on the shaping of our great nation. This list contains both fiction and nonfiction pieces of works that celebrate our heritage, illuminating both the good and the bad of what it took for us to gain our freedom. In this compelling sequel to Chains, acclaimed author Laurie Halse Anderson shifts perspective from Isabel to Curzon and brings to the page the tale of what it takes for runaway slaves to forge their own paths in a world of obstacles—and in the midst of the American Revolution. Beverly, Harriet, Madison, and Eston are Thomas Jefferson's children by one of his slaves, Sally Hemings, and while they do get special treatment - better work, better shoes, even violin lessons - they are still slaves, and are never to mention who their father is. The lighter-skinned children have been promised a chance to escape into white society, but what does this mean for the children who look more like their mother? As each child grows up, their questions about slavery and freedom become tougher, calling into question the real meaning of "life, liberty, and the pursuit of happiness." Told in three parts from the points of view of three of Jefferson's slaves - Beverly, Madison, and a third boy close to the Hemings family - these engaging and poignant voices shed light on what life was like as one of Jefferson's invisible offspring. In 1776, young Sophia Calderwood witnesses the execution of Nathan Hale in New York City, which is newly occupied by the British army. Sophia is horrified by the event and resolves to do all she can to help the American cause. Recruited as a spy, she becomes a maid in the home of General Clinton, the supreme commander of the British forces in America. Through her work she becomes aware that someone in the American army might be switching sides, and she uncovers a plot that will grievously damage the Americans if it succeeds. But the identity of the would-be traitor is so shocking that no one believes her, and so Sophia decides to stop the treacherous plot herself, at great personal peril: She’s young, she’s a girl, and she’s running out of time. And if she fails, she’s facing an execution of her own. In this masterful book, David McCullough tells the intensely human story of those who marched with General George Washington in the year of the Declaration of Independence - when the whole American cause was riding on their success, without which all hope for independence would have been dashed and the noble ideals of the Declaration would have amounted to little more than words on paper. But it is the American commander-in-chief who stands foremost - Washington, who had never before led an army in battle. Written as a companion work to his celebrated biography of John Adams, David McCullough's 1776 is another landmark in the literature of American history. Founding Mothers, an intimate and illuminating look at the fervently patriotic and passionate women whose tireless pursuits on behalf of their families–and their country–proved just as crucial to the forging of a new nation as the rebellion that established it. While much has been written about the men who signed the Declaration of Independence, battled the British, and framed the Constitution, the wives, mothers, sisters and daughters they left behind have been little noticed by history. #1 New York Timesbestselling author Cokie Roberts brings us women who fought the Revolution as valiantly as the men, often defending their very doorsteps. Drawing upon personal correspondence, private journals, and even favoured recipes, Roberts reveals the often surprising stories of these fascinating women, bringing to life the everyday trials and extraordinary triumphs of individuals like Abigail Adams, Mercy Otis Warren, Deborah Read Franklin, Eliza Pinckney, Catherine Littlefield Green, Esther DeBerdt Reed and Martha Washington–proving that without our exemplary women, the new country might have never survived. In Washington: A Life biographer Ron Chernow provides a richly nuanced portrait of the father of our nation. With a breadth & depth matched by no other one-volume life, this crisply paced narrative carries readers thru his troubled boyhood, his precocious feats in the French & Indian War, his creation of Mt Vernon, his heroic exploits with the Continental Army, his presiding over the Constitutional Convention & his performance as the 1st president. Despite the reverence his name inspires, Washington remains a lifeless waxwork for many, worthy but dull. A laconic man of granite self-control, he often arouses more respect than affection. This work, based on massive research, dashes the stereotype of a stolid, unemotional man. A strapping 6', Washington was a celebrated horseman, elegant dancer & tireless hunter, with a fiercely guarded emotional life. Chernow brings to vivid life a dashing, passionate man of fiery opinions & many moods. Probing his private life, he explores his fraught relationship with his crusty mother, his youthful infatuation with the married Sally Fairfax & his often conflicted feelings toward his adopted children & grandchildren. He also provides a portrait of his marriage to Martha & his complex behavior as a slave master. At the same time this is an astute portrait of a canny politician who knew how to inspire people. Not only did Washington gather around himself the foremost figures of the age, including Madison, Hamilton, Adams & Jefferson, but he also orchestrated their actions to shape the new federal government, define the separation of powers & establish the office of the presidency. This biography takes us on a page-turning journey thru the formative events of America's founding. With a dramatic sweep worthy of its subject, this is a magisterial work from an elegant storyteller.